We have used A+ Interactive Math in the past and we have liked it. Recently, they have added some new programs to their site, called Math Mini-Courses. They are geared towards closing learning gaps. So, if your child has trouble with a certain topic within math, they can use the mini-courses to get caught up, close learning gaps and help with understanding! I was happy to be able to review it and see what it is all about! When you buy one of the mini-courses, you get access to it for a year. Although, it will only take two to three months to finish each course, you will still have access for a year. This gives you the opportunity to go back and review if you would like. The programs have been great for my kids to get them caught up on their knowledge. 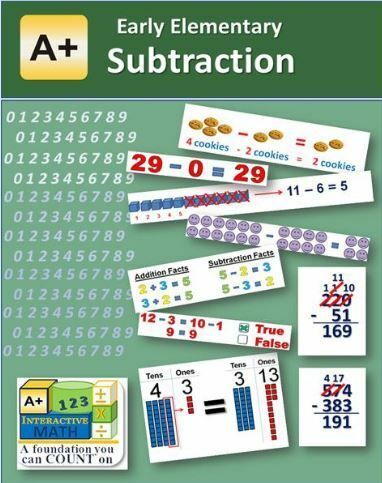 The only thing I don’t like about the subtraction program is one of the ways they explain it. They explain that one of the ways to subtract is to do a thing called reverse counting. I don’t know if there is research behind this way of teaching subtraction, but I just don’t like it. I feel it makes things more confusing. You may not mind it, but I thought I would mention it. Benjamin has seen some major improvement in his multiplication skills since starting to use A+ Interactive! I will say that when it came time for multiplying multiple numbers, it was not very informative. It seemed as if my son was supposed to already have the general concept down. So, I had to explain it to him. It was no big deal, but it seems like something that should have been explained better. The student will begin at the first picture that says, “Video Lessons w/Interactive Review (Q/A)”. This is where the bulk of the learning happens. As the name states, these lessons are interactive… so, it begins with the student watching a video with demonstrations and explanations of the information. Then the program asks the student questions over the material. If they get it wrong, there is an explanation as to what the correct answer is and why. The next picture is “View/Generate Online Worksheets & Tests”. This is where the student gets to see how much they retain from the lesson. They can practice with the worksheets and then use the tests to test themselves. The next two pictures are essentially the same as the first two, but they are printables. Some kids work better when they have actual pencil in hand and can write on real paper. This program gives you the opportunity to do that. The next picture is the one labeled, “View Reports”. This one is more for the parent (and you have similar reports in your parent dashboard as well). This shows you how your child is doing on all the worksheets and tests. If they aren’t making the grade you would like, you can have them retake some of the info. The program does all the grading for you! There are SO MANY topics to choose from for your children!! I highly encourage you to check out all the mini-courses and see if one fits the needs for your family. For whom? I know my kids are homeschooled, but this program is really for anyone. Any student that needs help with getting better skills in a certain topic in math could use this program!